Who can resist an apple fritter? Alyssa and I are both crazy about the apple fritters at Reading Terminal Market. Dotties, my local doughnut shop, makes a mean vegan apple fritter. These tasty pastries are a highlight of apple picking trips (or at least stiff competition for the apple cider doughnuts). 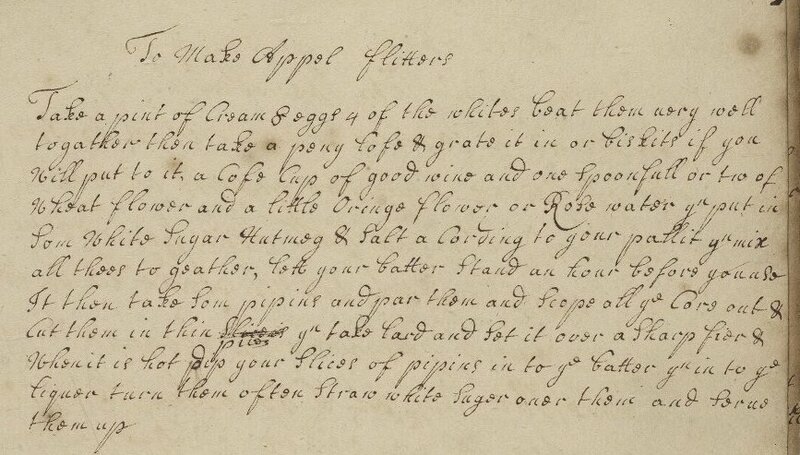 Naturally, I was thrilled when Alyssa added a recipe for “appel flitters” to our cooking list. This one comes from UPenn MS Codex 830, Eliz[abeth?] Kendrick’s recipe book which was signed and dated by its original owner in 1723. Unlike their complex, pastry cousins, these apple fritters are battered and shallow-fried apple slices. They tasted best when they’d cooled just enough to eat without a burn risk. Although pippins are a common apple variety in England, they’re much less common here. We used two aging honeycrisp apples I had around. Instead of using bread (penny-loaf) we used sweet, store-bought ladyfingers (biskits) to bulk out the batter. (We’ve made our own “biskets” before.) You might need to adjust the sugar if you use grated bread. We opted for rosewater over orange blossom water and neutral frying oil instead of lard. Even halved, this recipe made enough batter to coat six (or even eight?) apples. We cooked up two in our test and had lots of leftover batter. Whip together the cream, egg whites, and eggs in a large bowl. In a smaller bowl, combine the crumbled ladyfingers, wine, flower, rosewater, sugar, and spices. When the cookies are soft, add this mix to the cream mix and stir to combine. The batter will be somewhat clumpy. Let it sit for an hour. After the dough has rested, prepare your apples. In a sturdy, high-sided pot, heat your oil. (We used a dutch oven to prevent oil spatter.) Dip apples in the batter and cook in the oil for 1 minute on each side (until the outside is brown). Spicy, sweet, fried apples: A radical transformation of those apples in the bottom of my fridge. The frying process was fun to do together and could be a nice activity for a rainy weekend afternoon. I think these apples would be especially delicious on top of vanilla ice cream or served with this syllabub.